For the last five years or more, Ventoux had sat at the very top of my list of ‘must do’ climbs. I didn’t know anything about the climb until I read Armstrong’s autobiography in 2003, in which he described Ventoux as the hardest of the road climbs used by the Tour de France. That instantly caught my interest, but its isolated position in the far south of France, sat alone in the Provencal plain, meant I’d never had the opportunity to climb it. 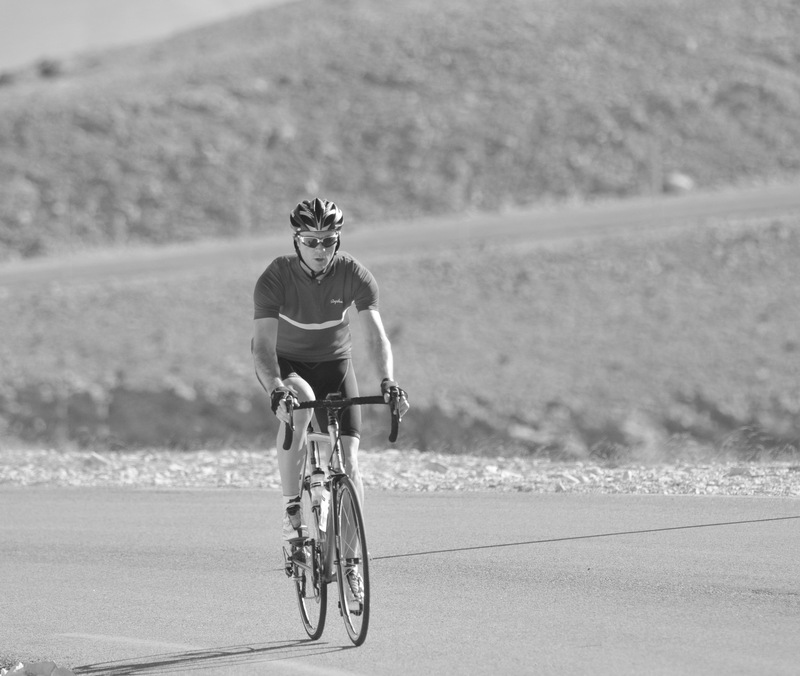 Could it really be harder than Alpe d’Huez, or the Tourmalet, or Hautacam? Then, back in the autumn of 2009, someone mentioned the ‘Club des Cingles du Mont Ventoux’. Entry to the Club was simple – Ventoux has three separate (road) climbs, radiating from the summit like spokes from a wheel and named after their respective start towns. If you did all three in one day, you became a member. Simple. The Club was started in 1988 by Christian Pic and has over 4,000 members: just over half are French, followed by Belgium, the Netherlands, Italy and the US. Inexplicably, it’s quite rare for Brits to do it. And so the plan formed in my mind. I started to gather info on the ‘Bald Mountain’ or the ‘Giant of Provence’ as it’s also known. On paper the membership route looked tough. It wasn’t the 136 km that was the problem, but rather the fact that half of this was climbing. The classic route from Bedoin was 21 km at an average of 7.5%, from Malaucene the same, and the third ascent was 26 km at a merciful 4.7%. Mont Ventoux is 1,912 m at its summit and the vertical distance for each route was 1,610 m, 1,570 m and 1,220 m respectively, for a total of 4,400 m of climbing over 68 km. As a comparison, 2008’s Etape du Tour was only 2,612 m over 39 km. Cinglé in French means ‘crazy’ and has the synonym fou – ‘mad’. The Club des Cinglés du Mont Ventoux is literally a club for ‘mad crazies’! The most famous ascent was from Bedoin so this would be my first climb – it was supposed to be the hardest, so I’d do it while I was fresh. I’d then descend to Malaucene, turn around and climb straight back to the summit – reckoned to be almost identical in difficulty to the Bedoin route. From there, I’d descend to Sault and then retrace my steps back to the summit for the final time, before eventually descending to Bedoin. Although the climbing was significant, it was undeniably a short day and I couldn’t see why it was such a tough ride. Certainly some of my previous days looked much tougher, with similar amounts of climbing and a lot more distance thrown in. However, I then did a rough mental time calculation: a reasonable (amateur) ascent was reckoned to be c. 1 hr 45 mins. If I allowed two hours for each one, plus 45 minutes for each descent, then I was looking at 8 hrs 15 mins. That was a long day. Factor in that 6 hours would be spent climbing and I started to understand why it might be tough. Even my Tourmalet day in 2007 probably hadn’t involved more than 5 hours of climbing and that had natural breaks in between where you could eat, drink and spin for a while. The final thing to do before departure was to set up my attempt for accreditation by the Club. I checked the web and found the details and wrote to Christian Pic, and also transferred €20 to his account. He sent me my card for stamping and some instructions that offered various bits of advice, the key one being that verification stamps could be found in almost every shop in the start towns and in two places at the summit – the restaurant and the ‘magasin’ or souvenir shop. I woke early, had breakfast at 7.45 and went down into the car park to pump up my tyres. Another guest, a Dutch lady in her mid 50’s was also preparing to ride away and she asked me to put some air into her tyres with my track pump. I willingly obliged and wished her luck. She asked about my ride and I explained that I was trying for all three ascents – she raised her eyebrows and wished me luck too, before riding away. I put my shoes on and left the hotel at 8.30 am. I was in Bedoin within 5 minutes and immediately found a magasin that had just opened. My French colleague, Thibault, had coached me to say “Pourais avoir le cachet s’il vous plait?” which translated into “Do you have a stamp [for my authentication card] please?” The girl behind the counter produced a stamp straight away and I was off again – the whole thing had taken no more than a minute. There’s a roundabout in Bedoin that’s considered the start of the climb and as I went around it, my watch said 8.42 am. The day was beautiful – not a cloud in the sky and light, cool winds from the north east. As I climbed out of the town into open countryside, the day couldn’t have been better. It was cool, chilly even, but I was quickly spinning fast enough to work up some heat and the fact that I was only wearing a jersey didn’t seem to matter. Few climbs are as well documented as the one from Bedoin. Every twist, turn, camber, ripple, gradient and the surrounding terrain has been described, eulogized and immortalized in cycling literature. The first 6 km are easy – lower chain ring stuff, but easy. The surface was perfect. It was late in the year, but I was riding through vineyards and if you’d added a little lavender and a few sunflowers, it would have been impossibly perfect. I was careful not to work too hard and purposefully kept changing up to one gear easier than I really needed. In this way, I avoided any early lactic acid and kept my cadence high. The gradient steepened from time to time, but would then even out again. I caught and passed the Dutch lady, probably going twice as quickly in reality and then reached the first crucial point of the climb at Saint Esteve, where the road turned sharp left and the gradient literally went from 4% to a solid 10. What follows is a long, long 9+ km of ascent through the forest with the grade always 9% or over. Some 17 km away, the summit loomed ominously. The road disappeared into a dense cedar forest and all views vanished. This was a place of legends: mercilessly steep and continuous for almost 10 km to Chalet Reynard. It was a place noted for it’s lack of wind and searing, stifling, airless heat, but I was lucky: it was late in the year and a cool breeze was blowing, so my only problem was the gradient. I stayed seated and spun the pedals. Up through the forest. It was silent, nothing moved, except the odd car. Although consistently steep, I was fresh, it was cool and I was riding well. I didn’t see another soul until close to Chalet Reynard, where the road briefly leveled out. I emerged from the tree cover and suddenly there it was, 7 km to my left, the summit. White, barren, windswept limestone screes. The road cut a clear line across this landscape. There are seven ‘zigs’ and ‘zags’ in all. Each zig, in a generally westerly direction, was steep – at least 10%. Each zag, to the north or north-east, caught the headwind: it was an evil combination. The wind was light in reality, but if it had been blowing hard, the zags would have been really tough. As it was, the wind was being kind to me, although it definitely carried an autumn chill. Nearing the top, I caught and passed my first cyclist of the day and thereby became the first person to reach the summit from Bedoin. I worked this out a few days later when I checked the website of the local photographer – I’d surprised him just before the final bend and he jumped up, snapped some shots and gave me a card with his web address on it. Looking at the shots a few days later, I was the first rider photographed. I felt slightly shaky as I reached the magasin at the summit at exactly 10.36 – meaning a time of 1 hour 54 minutes for the first ascent. The owner was just opening up, but stamped my card. I drank some water, ate a gel and a bar and headed straight down the other side of the mountain towards Malaucene. Two things then happened: I started to shiver and my bike started to shimmy. One was probably causing the other, but the shimmies surprised me – they just seemed too violent. I rode around them a little, but still made good time on the descent. It’s a wide road, with very steep drops in places and I was around 40 – 50 mph the whole time! A couple of sections of 12% offered notable accelerations and Malaucene arrived within 20 – 25 minutes: remarkable really. I was however, too cold and knew that I’d have to find a gilet – it had been a bad mistake to leave mine behind in the hotel. Fortunately, there was a bike shop right at the bottom of the descent and within 5 minutes I’d bought a gilet and had also stamped my card. At 11.15 I turned around and started the climb back up. The night before, I’d decided that I would have two gels on each ascent and three bars on each descent, plus some ride shots. However, in reality, the descent, coupled with the shimmies, was just too intense and I hadn’t eaten anything at all since leaving the summit, nor drunk enough. I started to drink more and took on some gels. But I’d committed a cardinal sin and started a deficit that would be hard to rectify. When planning the trip, I’d sought advice from David, a cyclist friend who had a second home an hour north in the Ardeche and went to Ventoux two or three times a year and therefore knew the mountain really well. As luck would have it, he’d agreed to join me for the final climb. The plan was that David would meet me after my second ascent and then join me for the descent to Sault and the final climb back to the summit. David had texted me earlier that morning to say that he would cross the mountain via the Malaucene road and sure enough, only a couple of km into my second climb, a small white van pulled alongside and a banana appeared out of the window! We said hello and David offered water, which I foolishly declined. He headed on towards the summit. My gradient steepened and for the first time that day, I felt like I was working hard. I was catching more sun now, the temperature was rising towards 30 degrees and the gradient was relentless, with long stretches up to 12%. I ate a Clif bar, but struggled to chew when working so hard and reminded myself that the gels were for the climbs and the bars for the descents. The climb seemed to go on forever and I felt pretty ropey for much of it. It was hot, I was tired, sweating profusely and clearly hadn’t eaten enough. I also realized that I should have carried more water (only one bottle was full when I started out from Malaucene) – I was now having to ration my water, which was ridiculous. Eventually, the road flattened slightly, which signaled the final stretch to the summit was just ahead. I emerged from the trees, back onto the barren rock screes. The wind was much less of an issue from this direction, but it was light anyway. The views of the Alps to the north-east were amazing. I eventually reached the summit after 2 hrs 15 mins of climbing. The route from Malaucene was exactly the same length as the road from Bedoin and the gradients were officially no worse. The general consensus seemed to be that the climb from Malaucene was a little easier than the one from Bedoin. But not for me. The Malaucene climb had really sapped my strength and I recognized the slightly shaky feeling when I dismounted at the summit for what it was – a mild bonk. The time was 1.30 – it had taken me 2 hrs 15 mins and probably 15 – 20 mins longer than it should have done. I’d certainly suffered and only experience had really helped i.e. the knowledge that things always get better if you just keep going and eat and drink as much as possible. David was ready and waiting for me and we headed down to Chalet Reynard. This time I had a gilet and the experience was so much better – I was warm! My bike however was still shimmying, and since I wasn’t shivering, it had to be my brand new HED wheels. So when we stopped briefly, I reset the wheels squarely in the dropouts, which sorted things out. I gulped a little coke when David offered and checked my stock of bars. We forked left just below the Chalet itself (the right fork returned to Bedoin). The descent was easily angled, but long and the road surface was ropey – bumpy, broken in places and the road was narrow. Eventually, we emerged from the cedar forest into open countryside. The weather remained nigh perfect – 30 degrees, not a cloud in the sky and light winds. We reached the bottom of the descent to find that Sault was actually 100 m above us on a small rocky outcrop. I took off my gilet and we climbed the few hundred meters into the town centre. The Office du Tourisme seemed like the best place to get a stamp and sure enough my French worked perfectly. We set off again straight away and were quickly starting the climb back to the summit. This was a long one though – 26 km at an average gradient of 4.7%. David was clearly way fresher than me and I admitted to feeling pretty screwed! He pulled alongside and proceeded to talk at me for the next 2 hrs – it was the best possible way of taking my mind off how I felt. He turned into the perfect ‘domestique’ keeping an eye on me, encouraging me to drink and handing me a gel every time he noticed our average speed dropping. It was hot, but the day was beautiful and we were riding our bikes on Ventoux. Life was good. Before I knew it, the gradient had eased and I found myself in my big chain ring! Sadly, this didn’t mean that I’d become a cycling God, but rather that we were approaching the brief easy section near Chalet Reynard. The gradient jumped immediately, but I knew this stretch from the first ascent this morning and it was fine. The wind was light, the day didn’t seem too hot and I was now riding on a combination of David’s gels and ‘finish-line adrenalin’. I looked at David and said, “it’s in the bag.” He smiled. We passed the Tommy Simpson memorial again and then the Col des Tempetes, the most wind exposed spot before the summit, but the Gods were being kind to me today and the wind barely registered against our onward path. The final ramp kicks up to 10% and beyond, so even the final few yards to the magasin and the final summit were tough. The owner was outside and simply looked at me and said “trois?” I agreed: “oui, trois.” I collected my last summit stamp with a big grin. The climb had taken 2 hrs and 10 mins – pretty good really, given the length and what had gone before! Interestingly, no one had passed me all day, despite the fact that there were cyclists everywhere!, so I was probably faster than I felt at times. I descended back to the Simpson memorial, paid my respects and sat on the steps for a few minutes, savouring the achievement and the unbelievable view to the south, out across Provence to the Mediterranean. The descent back down to Bedoin is one of the best anywhere in the world: fast, twisty in places, with perfect tarmac. It turned into one of the best 20 minutes of technical bends and speed I’ve ever found. It was extremely good, even rivaling the descents off Hautacam and the Soulor. Through the forest the temperature rose dramatically and I noted that insects were bouncing off my arms, legs and helmet – someone later explained that the forest was popular with bees and it wasn’t uncommon to get stung on the descent! I literally flew down the final 4 km to Bedoin. I picked up my final stamp, recorded the time and rode slowly to my hotel. I was now a member of the Club des Cingles du Mont Ventoux – Number 3991 to be precise. NB. A few weeks later, whilst writing this and gathering material, I read another account of ‘three in a day’ and like me, the rider found the Malaucene climb to be the worst part.